Aceh — the province that sits atop the infamous Indonesian island of Sumatra — entered the imaginations of most of the world following the 2004 Indian Ocean earthquake and tsunami. After that devastating wave of destruction, another wave soon followed: that of international aid, money, and attention. Hundreds of organisations and thousands of international staff modified Aceh’s human landscape as the massive post-disaster recovery program lurched into action. A decade later, when this human tide receded, Aceh was a different place: homes and infrastructure had been rebuilt and people resettled. Aceh’s political defiance against central government had shifted from a civil war to a tense political jostle, leaving the lines of authority blurry and the climate for business and investment a risky one. This altered landscape presented challenging new opportunities for enterprising locals and the few foreigners that stayed on after the mass-humanitarian contingent, and their money, left. 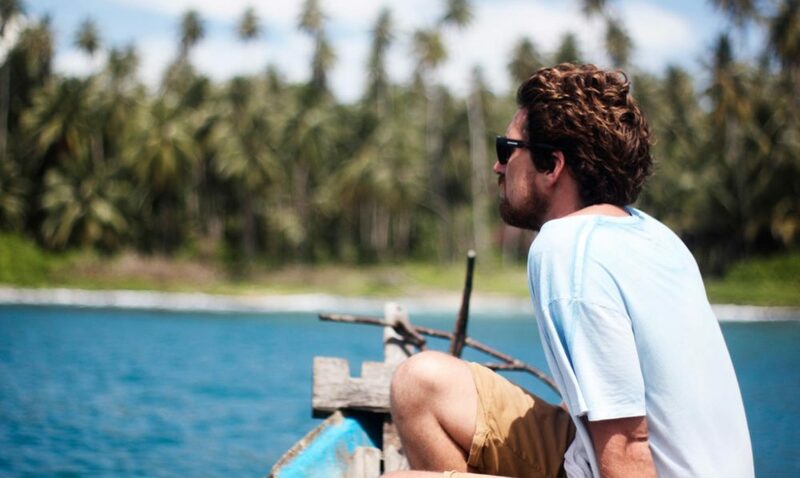 I’ve come to the island of Simeulue — about 100 kilometres off mainland Aceh — to learn how expat couple Jane Dunlop and Luke Swainson have transitioned from being part of the initial humanitarian response to becoming socially- and environmentally-minded entrepreneurs. For the duration of my visit, I’m staying at their fledgling surf resort, Mahi-Mahi — a spacious and secluded retreat, which sits directly in front of the island’s most consistent surf spot, simply known as ‘the peak’. Mahi-Mahi is one of only a handful of unassuming resorts and surf camps on the island. It’s also the island’s newest and most distinctive accommodation and charter boat provider. Two hundred year old traditional buildings were flat-packed and shipped from Java, and have been given a new life at Mahi-Mahi. These beautiful buildings are cool, airy and imbued with history and character. The centre point of the site is the open-air joglo, a communal space assembled entirely without nails. Each piece of the building cleverly locks together with the next, all deep and dark teak, intricately carved. It is immense. During my two weeks on Simeulue I get a taste of what doing business can be like in Indonesia. On excursions to scope small offshore islands for a virgin coconut oil business, we dive off thin, wooden fishing boats and swim ashore to count coconuts and check for monkey infestation. The locals working the island expertly slice open green coconuts to replenish us after our long swim. We wander around the islands considering tourism potential and finding crucial turtle nesting areas. I laugh as Luke, soaking wet in pink-and-grey striped underwear, liaises with the plantation workers about yield, docking and transport logistics. Is this what doing business is really like in the archipelago republic? I quickly learn that Mahi-Mahi, and the developing virgin coconut oil business, are just the beginnings of something much bigger. The umbrella organisation — the vision — is Ecosystem Impact. This is about moving to a new way of doing business in Indonesia: “the historical situation in Indonesia is of business being the bad guy, and so there being this massive lack of trust, and that makes it really difficult to get things off the ground. There are so many hurdles with the government and community, as well as challenges at an investor level because of perceptions of high risk,” Jane explains. With Ecosystem Impact, Jane and Luke are setting themselves up as important intermediaries between sources of foreign capital and the local environment they know so well. But before they can really fulfil this role, Jane and Luke realised that they needed to prove that they can do it themselves; that they can take an idea and work with investors, communities and government to create a responsible and profitable business. And that’s where their focus is at present: establishing their own socially and environmentally conscious businesses that turn a profit, contribute finance and expertise to local environmental conservation projects, and provide the funding required for Ecosystem Impact to play its paramount role: nurturing and developing sustainable Indonesian businesses. “This is where you can have a big impact because if you’re helping an emerging business to think about how it’s going to function in terms of its financial, environmental and social aspects, and you support that business to grow, it can make a substantial difference at the larger scale,” observes Luke. It’s about helping businesses find that working balance between financial pragmatism and proactive social and environmental responsibility. I spend most of my days here surfing and exploring the island’s empty west coast. 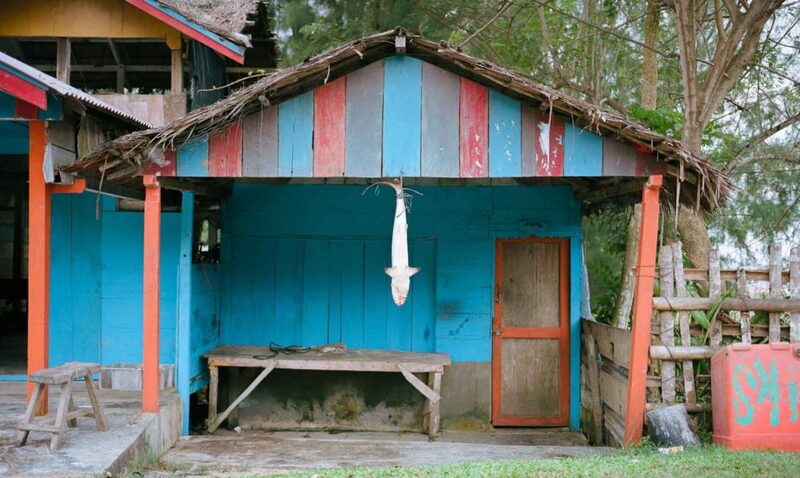 Things are very quiet on Simeulue. We are, after all, in the doldrums: that equatorial zone where the sun arcs high and straight across the sky and stillness is the status quo. A permanent, luminous haze hangs above the horizon, and there’s this spacious, timeless feeling, like we’re in a place where the world doesn’t really turn. Despite their near-decade of experience in Aceh, Jane and Luke often still find themselves in uncharted territory. “To try and marry local culture with a foreign investment framework just doesn’t work, so we’re operating in the middle, navigating between the two,” Jane says. Negotiating cultural difference is one of the biggest obstacles to doing business in Aceh — or in any foreign environment. Speaking the language makes a huge difference, Jane tells me, “but because you’ve got different cultures operating side-by-side, there are just these blind spots, where you don’t even realise that you’re totally misunderstanding a situation, yet you are.” For Jane, it’s a challenge, but one that brings a lot of opportunities to learn, build bridges and establish mutual understanding. Among young people around the world, there is an increasing desire to reconnect work with meaning and purpose. People want to work for employers, or operate businesses, that have a genuine commitment to improving the state of the world. Because such opportunities are so rare in the mainstream economy, there are a growing number of people who are finding innovative ways to connect business and private capital with social and environmental goals. I begin to see how Ecosystem Impact fits into this new community of social impact investment. The sector is growing rapidly worldwide, and has the potential to bring youthful innovation to both local and global issues. “It’s really taken off in Africa and South America, but it’s in its infancy here in Indonesia. We see ourselves at that intersection between meaning and money; where you feel like business can really make a positive contribution,” Jane explains. It’s all about starting from the ground up, to engender a culture of social and environmental responsibility in small business and entrepreneurship that will generate a real change in business mentality in emerging economies, among locals and foreign investors alike. It’s also a positive new avenue for those seeking opportunities abroad, especially in emerging economies. At the end of so many of my days on Simeulue — my arms as weak as wet noodles after surfing all day — we sit back and look west as the sun sets behind perfect, peeling waves that just endlessly persist. We gaze out over the Indian Ocean and silently contemplate all that vastness: that unbelievably huge mass of water that extends from Indonesia’s west coast all the way to East Africa, almost completely uninterrupted by land. It’s from this massive ocean that Simeulue’s wealth of waves come. They radiate out from weather systems, travelling hundreds of kilometres while merging and building, before they rise out of deep water and crash onto Simeulue’s reefs. As we lean back into our chairs and enjoy the end result of this long process, I find myself beginning to share Jane and Luke’s optimism for Indonesia. It may be small and humble beginnings, but it feels right and it feels good. I can see their wider vision starting to take shape, and in these two dedicated young people, a sense of self-belief that they’ll be playing a part in positive change for a region that’s been so deeply scarred in the recent past.